Lake Garda was formed by a glacier that flowed down from the Dolomites, cutting through and gouging out the valley. Eventually the ice glacier melted, resulting in the stunning freshwater lake it is today. It was created in the Ice Ages 1.5 million years ago...just before our UK and Australian class chairmen were born…..! 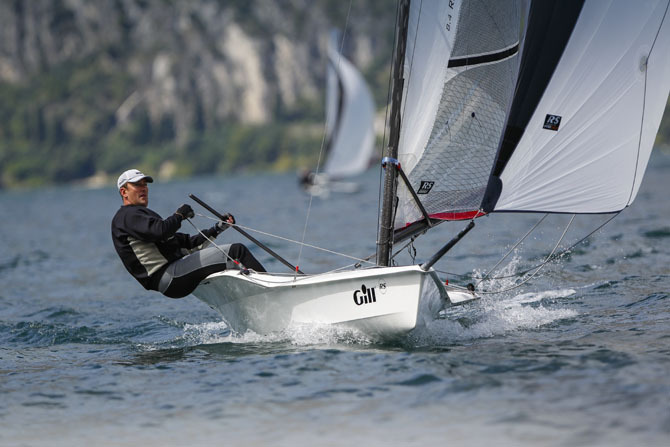 Sailors from as far afield as Australia, Switzerland, France, Ireland, Wales and England joined the local Italians for an event to rival the RS100 Cowes week which has some even older entries. 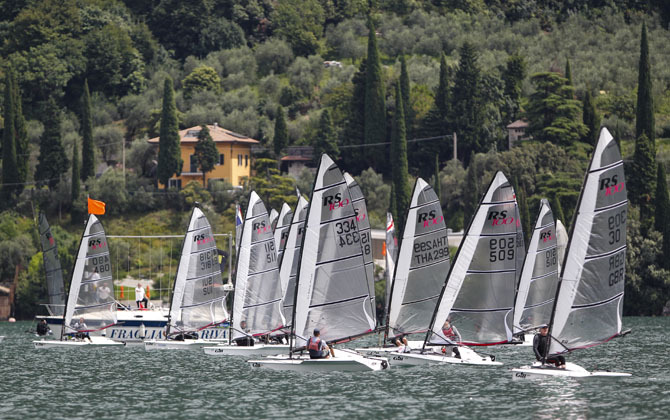 Two courses were laid with one up against the cliffs in the usual Garda spot and one towards the eastern side of the lake…..the RS100s shared their course with the RS800s on the cliff course windward leeward race track. Monday dawned……cloudy but hot…..no chance of the best ORA after a few days of thunderstorms but at 2pm a steady force 4 settled in……15 boats had a massive start line and the fleet divided evenly between four at the pin, a few mid line and half a dozen at the committee boat end. Huw Powell (Wales), Andre Blasse (Australia), Mark Cotgrove (currently France but becoming Spanish next week) and Alberto Zamo (Italy) got to the windward mark first. No-one from the committee boat end did well. Downwind saw some place changing with the cliffs not the best place to be and Powell rounded ahead of Cotgrove and Zamo. Al Hall (England) made ground as the heavyweights slowed as the wind started to ease slightly. The final beat saw Powell extend to win by a good margin with Cotgrove (second) and Zamo (third) separated by two boat lengths. …..and then the wind died and everyone rocked home to a RS social of free beer and pasta. An amazing dry lightning storm ensued with lightning every two or three seconds, followed by gale force winds and torrential rain. 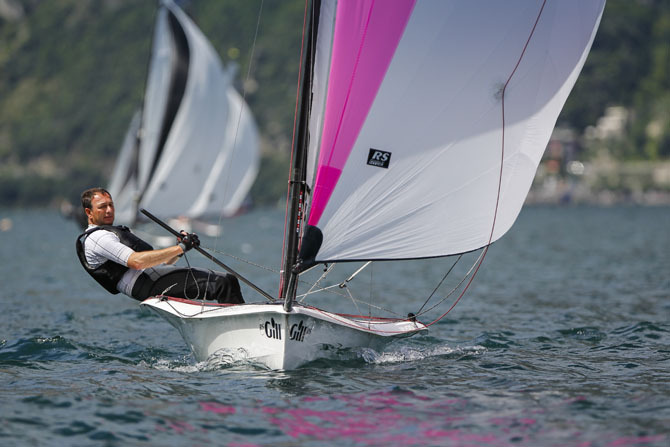 What more can you expect in Riva Del Garda…..! The signal to launch came at Midday and the fleet set out towards the Eastern Course with a steady force 4 Northerly ‘Pela’ wind. The first race of the day got underway with Michel Rotach (Swiss) leading at the windward mark closely followed by Andre Blasse & Al Hall. As the wind continued to die the race was abandoned shortly thereafter much to the relief of Huw Powell & Blasse who were then languishing some way back after finding wind holes on the course. After a short interval a force 5 set in unexpectedly from the South as dark storm clouds approach (these are becoming the norm this week)…. the race team then had to turn the course around (not an easy feat in Garda) and the race finally started. Huw Powell established an unassailable lead at the windward mark which stayed in place for the rest of the race. The early finishers were granted a result with Cotgrove just squeezing past Rotach on the line for the minor places. The rest of the fleet were counted in their positions on the course as they were out of time becalmed. So Powell leads with two bullets, Cotgrove second, Alberto Zamo third and Hall fourth. The fleet are hoping for perhaps a better weather tomorrow…..! Not quite a classic Garda day but almost as good. An amendment to the sailing instructions posted last night meant an early start at 11am. The fleet ventured out in a Northerly (Pela) force 4 and racing started promptly on a trapezoid course under the Western Cliffs. Whilst Mark Cotgrove slept (not knowing about the early start), Andre Blasse powered upwind and rounded first followed by usual suspect Powell and Hall third. Blasse went for the hyper space button only to find he couldn’t lay the outer loop mark. Powell quickly took control with Hall in hot pursuit. 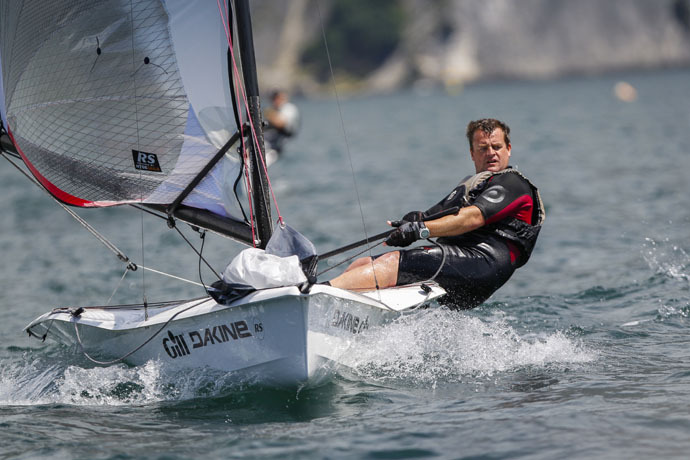 The second beat saw Blasse and Boyde power past Hall upwind with Powell holding a commanding lead to take the bullet and Blasse and Boyde holding station. Race 2 saw carnage at the pin end with Cotgrove and Blasse getting involved. Boyde took advantage to power upwind closely followed by Powell and Hall. Blasse closed the gap at the windward mark but downwind Powell overhauled Boyde with Hall maintaining third. The final beat saw Blasse powering upwind to close the gap on Powell but all to no avail as Huw extended downwind, Blasse second and Hall third. 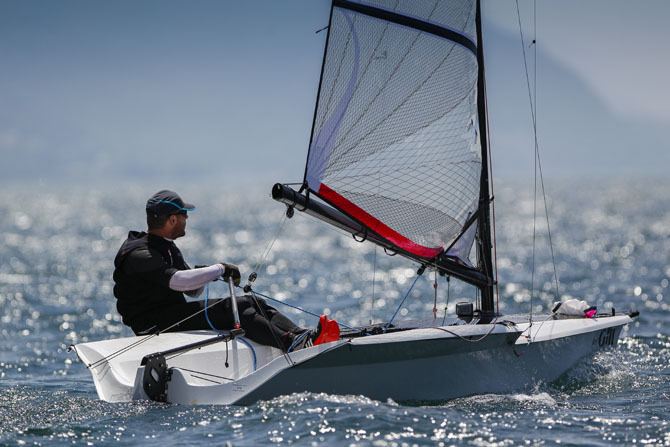 Race 3 saw the Pela wind slowly begin to diminish and Powell, Boyde and Hall were the unlucky trio when the race was abandoned on lap three with the finish a tantalising 400 metres away. Race 3 revisted: The southerly ORA then settled in very quickly at the top end of a force 4. The pin end was favoured with Powell leading at the windmark followed by Cotgrove and Hall. Downwind the cliffs were calling as Powell extended and Zamo, Boyde and Blasse gained significantly with Hall losing out. Positions were maintained until the final run with Powell finishing ahead by a huge margin, Cotgrove second and Hall cleared three boats on the last run to finish third. A classic Garda day, sunny, windy and what we all came for…..! 3 races held back to back in fabulous top of force 4 force 5 all day….many smiling faces in the bar. Race one started with the usual 10-15 degree pin end bias set closer to the Eastern cliffs and not far from the Northern Garda shore. Al Hall won the pin end as has been standard practice all week with Boyde and Blasse in close proximity, however a significant right shift after a few minutes favoured Emmett O’Sullivan (IRE) and Powell who had mid line starts. Powell came through to lead at the windmark closely followed by Boyde. Downwind Powell and Boyde extended to hold their own race whilst Hall held off Cotgrove until the final mark rounding when Hall got his hardening up technique wrong and allowed Cotgrove into third. Race two of the day: Still a pin end bias and this time the race was on to the Eastern cliffs where a decent wind bend and top of force 5 pressure was found. Blasse got the shifts right to lead at the windward mark closely followed by Powell and Michel Rotach (who had found new boat speed after a new slot gasket fitting). Blasse hoisted, struggled to get to the trapezoid spreader mark allowing Powell to slip through to windward. Powell then extended downwind whilst the trapezoid mark became littered with capsized boats. Cotgrove came through to second and Rotach comfortably held on to third. Race three – the fleet split upwind after Blasse stalled at the pin end causing both himself and Hall to gybe and start on port. Powell led the charge to the Eastern cliffs with half the fleet in tow whilst Blasse led the other half directly to the windward mark on port. However about two thirds of the way up the beat the wind mid course died off a little leaving Blasse and Hall wallowing in the heavy chop. Meanwhile Powell came away from the cliffs on a huge lift in decent breeze closely pursued by Boyde. They rounded together with RS800s everywhere causing carnage at the mark. Downwind Rotach hit the cliffs and came through the fleet almost catching Powell and slipping past Boyde. The trapezoid mark was once again littered with capsized boats as the ORA showed it true teeth with gusts into force 5/6. Amongst many Cotgrove succumbed with Blasse allowing Powell, Rotach and Boyde away. The final beat Powell held position covering Rotach tack for tack and on the final run most boats stayed near the cliffs in the near force 6 breeze. So Huw Powell is once again crowned European Champion with a day to spare with eight firsts to his name and can currently be found in the bar. The race for the minor places is close with Cotgrove, Boyde and Hall all in contention. Day 5 – Garda at its very best…. The RS party on Thursday night courtesy of our very generous sponsor Gill, who also provided an unusual free cocktail or two for the sailors (did anyone work out what was in it?? ), left Martin Boyde with a rehydration problem on Friday…was he going to succumb…? After an overnight analysis Huw decided to go for all ten firsts and Mark Cotgrove virtually had second secure so the main battle was for third place. Friday dawned flat calm, sunny and hot….all the signs of a classic day and we were not disappointed. The fleet drifted out to the start line as the black line appeared on the horizon. With a fairly unbiased line the first race was started in a breezy top end of a force five and the race to the western cliffs was on. Blasse got there first with his 100kg plus slender frame allowing him to ease away from Cotgrove & Powell. Sadly for Blasse his Achilles heel caught up with him downwind allowing Powell through swiftly followed by Cotgrove with those positions held to the finish. Meanwhile Hall, Zamo and Boyde were a few boat lengths apart with Boyde holding the ace in terms of upwind boat speed. Downwind saw Hall’s chances for third virtually disappear after a ‘wine glass and sheet under the pole’ moment saw him DNF. Advantage Zamo and Boyde. First to break was Boyde who had one of those ‘tiller extension breaking’ moments forcing him into retirement. Suddenly a third place was back on for Hall if he could finish third in this final race. Zamo covered Hall everywhere and tried to gybe just in front of him downwind. The move didn’t come off and Zamo took to a watery grave with Hall attempting in vain to avoid the stricken Italian’s vessel. The result both boats capsized. Hall recovered very quickly but in that moment Emmett O’Sullivan sailed past to secure a third place in the race with Hall in fourth and Mostyn Evans securing his best ever race RS100 result in fifth. Zamo finally recovered his vessel to finish sixth.